More and more Filipinos are going online to their shopping. Nothing can be easier than going online and with just a few clicks of your mouse button purchase what you want. Then just wait for your items to be delivered to your doorstep. You can get almost anything from the Internet nowadays; books, electronic equipment, gadgets, etc. I recently helped a friend to find car on the Internet. Though I wasn't sure if we could find one online, we managed to find a site with a good list of several second hand cars for sale. The site we entered was AyosDito. 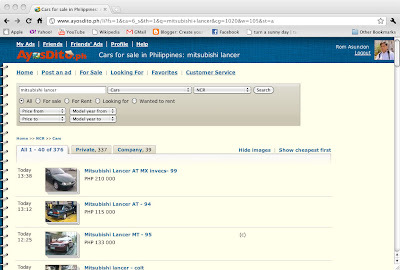 an online buy and sell Philippines site who want to buy or sell something online. We used the search function and we were given a list of units of the brand and type of car we were looking for. The listing was in order of the date the seller posted his item. What is good with this site is we were able to limit the search to easily find items in the region where we live. My friend a fairly good deal and would contact the seller soon. While on the subject of used cars, there's a post on the web that's worth checking out when you're planning to get a used car. The site gives a list of used cars to buy and why they offer the best bang for the buck. The writer also says that selecting from the best used cars to buy will help you save money and may even make you drive the car you've always wanted to have. Hopefully someone can come up with a similar list for us Filipino used car buyers. i like buying stuff online... and selling, too. there is less hassle, less fuss. I haven't tried it yet. Maybe I'll check it out soon. Nagtataka lang ako bakit may warning sila mismo na mag-ingat sa bawat transaction. Wala ba silang paraan para seguraduhin na di manloloko ang nag-aadvertise sa kanila? Sa tutoo lang. Siguro just to make their clients aware that these things happen. Mabuti na ito kaya wala man lamang warning na nangyayari talaga ang mga ganitong bagay online.